SIUE’s Brad Noble, PhD, associate professor in the Department of Electrical and Computer Engineering in the School of Engineering, participated in a discussion on autonomous vehicles during an Aug. 23 segment of Conversation with Lee Presser. Noble’s appearance will air at 7 p.m. Monday, Sept. 26 on Charter channel 994. During the interview, Noble discusses the technological advancements that have led to automated systems, like the autonomous vehicles being developed by companies such as Google and Mercedes-Benz, as well as the technical challenges yet to be overcome before they will be widely seen on roads and highways. Noble also discusses the SIUE School of Engineering’s new mechatronics degree, which directly relates to this topic. Of interest to battery powered devices, the interview begins with a brief discussion about a patent he and Michael Shaw, PhD, professor in the SIUE Department of Chemistry, obtained for a new type of potentiostat, a device used in battery and fuel cell research and design. 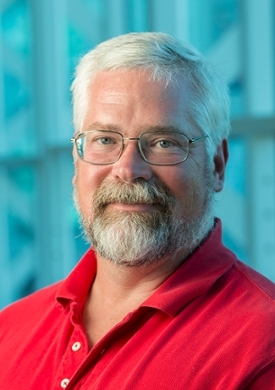 Photo: Brad Noble, PhD, associate professor in the Department of Electrical and Computer Engineering in the SIUE School of Engineering.